We don’t have quite as many holiday food traditions as Lisa’s family — the meals always vary depending on whether we stay in California or travel east to my parents’ home — but one tradition that reaches back generations is, as in many families, cookie baking. My grandmother and mother kept tallies of the cookie count in the back pages of increasingly-tattered copies of Joy of Cooking, and now I do, too. I don’t produce as many cookies as my mom did in her heyday (when she hosted Christmas open houses for the entire church congregation and choir), but I like the history in the lists: 1998 (childless, newly partnered with Tony, and — most tellingly — in the thick of dissertation writing), I produced 11 different types of cookies; Christmas 2001 (the first year in our house) I made 10. The list for Christmas 2003 reads, “pneumonia, strep throat, bronchitis, and truffles.” Thank goodness for truffles! A new tradition, and one I very happily encourage, is for my dad to make a couple batches of cookies with the kids. 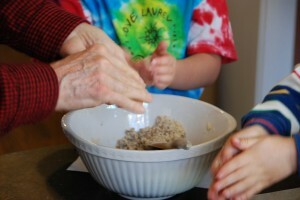 I don’t know quite how this started — probably just my dad wanted bourbon balls one year and realized that, despite the main ingredient, they are a terrifically kid-friendly, craft-project kind of cookie: smash vanilla wafers, mix with flavorings, scoop out balls, done — but the kids love it, of course. It’s fun to smash and mush. 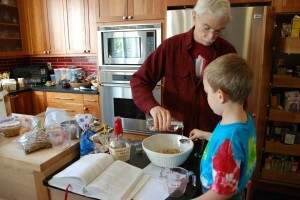 It’s fun to cook with Granddad. And it’s exciting to use such a grown-up ingredient as bourbon, and one which is adored by one of their favorite characters — Captain Haddock — in their beloved Tintin books. Combine all the ingredients and roll into small balls. Roll in confectioner’s sugar and store at room temperature. They improve as they age.